The 9 Best Escape Rooms in Wisconsin! Escape rooms have been all the rage over the past few years. With a variety of them popping up across Wisconsin, now is the time to gather a group of friends, family or coworkers to work together and solve your way out of one! Here are the 9 best in the state! The Elusive Escape Room in Wisconsin Dells offers a run new activity in the area. The Dells are a popular tourist city filled with waterparks, shopping, food, and more. 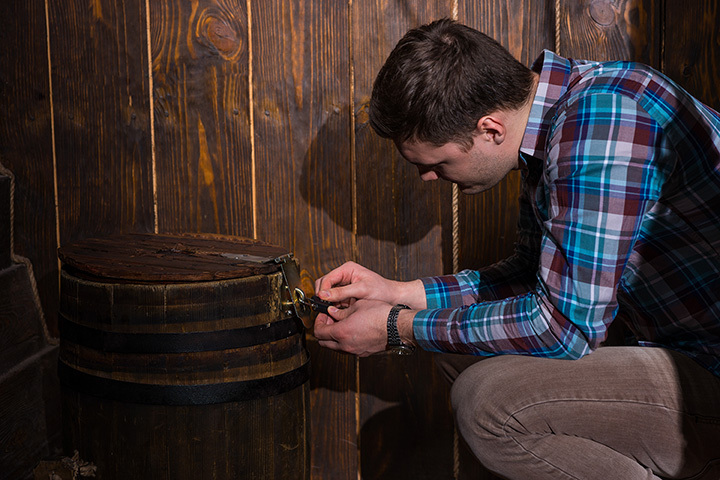 Add the Elusive Escape Room to your list for a fun activity that includes everyone. Located in the Market Square near West Towne Mall is Escape In Time. Pick between four themed rooms decorated and designed by world-class designers. Team up with your co-workers, friends, or family to solve puzzles—getting your team one step closer to the answer. Coined as “1 Room. 1 Team of Friends. 60 Minutes.” Check out one of the Milwaukee areas favorite escape room. Choose from: The Kidnapping, Museum Heist, Operation: Casino, or Hostage. All rooms are provided with unique storylines that will keep your entire party guessing and working together. Escape the Room is rated Milwaukee’s number one escape room. Escape the Room Milwaukee offers and exciting game great for all ages. Your next party will be the talk of friend group after you’ve tried Escape the Room. Choose from: The Agency, The Apartment, the Rec Room, and The Dig. Escape MKE is another highly rated Milwaukee favorite for escape rooms. Gather a team of 4-10 people, choose your mission, and work together to solve the mystery in under 60 minutes. Choose between five different rooms offer different Agent Levels dependent on your group. These well-decorated escape rooms will have your party coming back time after time! Choose a room, follow the clues, solve puzzles, and crack the code at La Crosse Escape Room. Choose between four themed rooms: Desert Island, Aunt Edna’s Condo, Serial Killer: The Revolutionary, and Bank Heist. Each room offers a different back-story, décor that’s on-theme, clues, and one ultimate mission. If you love adventure, teamwork, and fun sign up for Escape Room Wisconsin. Use your wit and logic to solve puzzles and gain the next clue. Your team will work together to escape their heavily themed rooms in less than 60 minutes. Think you have the gut instinct? Sign up today. Try Grandpa’s Candy Shop and Eddie’s “The Fixer” Moonshine Shack, two themed escape rooms in Eagle River’s Northwoods Escape Rooms. Even the most skilled gamers and code crackers get stumped at Northwoods Escape Room. Solve the puzzle with your party and escape in record time! Four daring rooms and only 60 minutes to escape at The Encrypted Escape. Teams of 4-8 band together to solve puzzles and gather their next clue. Choose between Wonderland, 221B, Black Hat, and The Call. Will your party get out in time? Find out and book your room today!